Intellectual Property Rights are the legal rights granted to a person for his work that includes his invention, discovery, creative, artistic or literary work or words, phrases and symbols or designs for a fixed duration of time. Copyright is one of the Intellectual Property Rights. Copyright is a right which the law gives to the creator or owner of any literary, dramatic, musical or artistic work and the work of producers in form of cinematograph films and sound recordings. The owners of the copyright have certain exclusive rights which enable them to use their property without disturbance and to prevent the misuse of their property. Copyright comes with a bundle of rights that include rights of reproduction, communication to the public, adaptation, and translation of the work. The term ‘copyright’ is not defined in the Copyright Act, 1957 and in general terms, means the “right to copy” which is available only to the owner. Originality and not novelty is the key to assign copyright. It exists only on expression and not on ideas. Protects the rights of the authors over their creations, thereby protecting and rewarding their creativity. Creativity and progress go hand in hand, therefore, no civil society can exist without copyright protection and hence, the work of an author is protected. It motivates the owner and others and induces them to create more and thereby creates an environment inclusive of creativity. Strikes a balance between the rights of the owner as well as the society. The term of a copyright in case of literary, dramatic, musical or artistic works is the lifetime of the author plus sixty years while in case of cinematograph films, records, photographs, posthumous publication, works of Government and international agencies the term exists for sixty years from the date of publication. In case of broadcasting, copyright exists for twenty-five years from the year in which the broadcast was made. Use of any copyrighted work without the permission of the owner amounts to copyright infringement. Infringement occurs when a person intentionally or unintentionally copies/uses the work of another without credit. Infringement is usually classified into two categories- primary infringement and secondary infringement. Primary infringement is the actual act of copying, while secondary infringement includes unauthorised dealings like selling the pirated books, importing etc. In the case of secondary infringement, knowledge of infringement is present with the infringer while in the case of primary infringement, knowledge may or may not be present. Copies of copyrighted work are made for sale or hire without permission or authority, like in case of online piracy. A copyrighted work is performed in a public place. Infringing copies are distributed for the purpose of trade and personal gains. Infringing copies are imported from another country into India. There are certain acts that do not amount to copyright infringement. However, there are some conditions that must be fulfilled ensure that copyright infringement has not occurred. These conditions include the use of a copyrighted work for research, study, criticism, review, news reporting, use in a library, schools and legislation. Such uses of a copyrighted work are permitted without the need to obtain the permission of the copyright owner. Fair use: An important defense against copyright infringement, defined under Section 53 of the Copyright Act. The burden of proof an act of copyright infringement is on the owner. Performance by an amateur club or society, if the performance is in front of a non-paying audience. Making sound recordings of literary, dramatic or musical works under certain conditions. Proof of ownership of copyright. Substantial similarity between the original and the infringed copy. Copying amounts to improper appropriation. Interlocutory Injunction: It is the most important relief as it prevents the infringer from doing anything that amounts to copyright infringement. Financial relief: Under Section 55 and Section 58 of the Copyright Act, the copyright owner can claim three remedies- profits which lets the owner get the profits made through an unlawful act, compensatory damages and conversion damages calculated according to the value of the infringing article. Anton Pillar Order: It restrains the infringer from dealing in infringing goods or destroying them. It also allows the copyright owner and his lawyer to enter and search the premises of infringer and take goods into safe custody. Under this order, the infringer is required to disclose the names of all the suppliers and customers of infringing goods. Mareva Injunction: It is an order under which the court gets temporary custody of infringing goods, thereby preventing any chances of disposal. Norwich Pharmacal Order: It is passed to discover information from a third party. What happens if you Infringe a Copyright? Under the Copyright Act, 1957 the criminal action against copyright infringement can also be taken. The person found guilty of copyright infringement would be liable for punishment for Imprisonment not less than 6 months and up to 3 years, or fine of at least Rs. 50,000 to Rs. 2 lakhs. Under the criminal action against copyright infringement, a search and seizure of infringing goods may also be ordered by the court and the infringing goods may be delivered to the actual copyright owner. If you are not using an original literary, artistic or musical work, it is important to check all the licenses and permissions. Many copyright owners allow their work to be used without the need for direct permission, whereas, most copyright owners allow the use of their work only after you obtain a license or permission from them. Make sure that you use a copyrighted work under the ‘fair use’ policy for educational or research purposes. When getting a copyright for your work, consult a copyright lawyer to make sure that you are not infringing an already existing work. Awareness about copyright infringement and copyright laws is important in a developing society, as creativity is an essence of growth. It is important to talk to a copyright lawyer at every stage of dealing with a copyrighted work. This includes assistance for filing a copyright application, dealing with copyright infringement and defending the copyright. MyAdvo has a network of best copyright lawyers in India. Start by sending us an email at info@myadvo.in or call us at +919811782573. Intellectual Property Rights are legal rights that are granted to a person's creative, artistic work and many more. Read the Software Copyright in India. Takedown notice is one of the remedies available for the copyright infringement to owner of copyright. 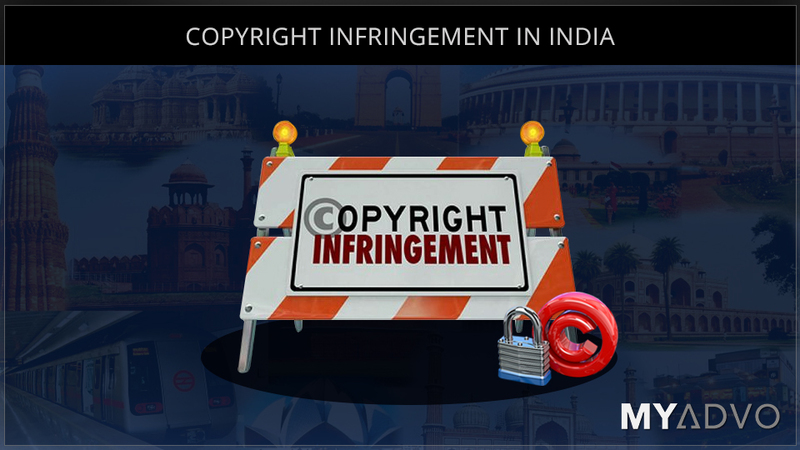 Copyright infringement notice or takedown notice can be sent to ISP informing them that the copyright is being infringed by the concerned website. Trademark Infringement and passing off are related to violation of the rights of a trademark owner. However, the two are very different. Read more to know the difference between trademark infringement and passing off. A copyright lawyer in India can help you in obtaining a copyright in music. Talk to the best copyright lawyers in India through MyAdvo to copyright a song.